We provide a wide variety of lift and tilt tables so that you can safely move product throughout your facility without having to worry about employee injury. These lift tables are designed in order to allow easy lift and positioning of products within your facility. This model is designed in order to lift up to 4,000 lbs and has a variety of different features. 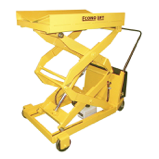 The EZ Loader E is a stainless steel automatic pallet positioner and has the ability to lift up to 4,000 lbs. 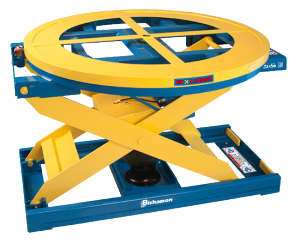 This lift table has a variety of different features including capacity adjustment without requiring a change in air pressure. The EZ Loader SS is designed as a self-levelling pallet positioner and pallet leveller and has the ability to lift up to 4,000 lbs. The The EZ X Loader is an automatic pallet positioner and has the ability to lift up to 4,000 lbs. 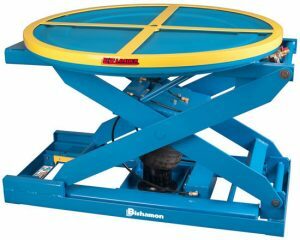 This lift table has a variety of different features including capacity adjustment without requiring a change in air pressure. This lift table has a variety of different features including capacity adjustment without requiring a change in air pressure, a captive air system in order to eliminate the use of mechanical springs. These light duty and portable will enable you to lift a variety of products, with a 1000 pound capacity! 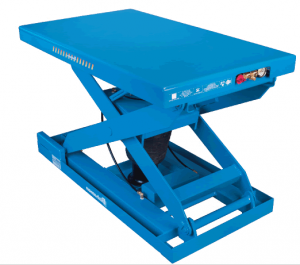 This compact lift table is designed in order to lift a variety of items, without taking up a lot of space, making it perfect for maintenance shops and transporting items. 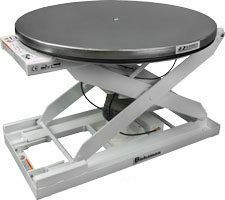 These portable lift tables are designed to allow you to safely equipment weighing up to 2,200 lbs containers. These lift tables are designed in order to allow you to safely lift containers through use of a foot pump, and can lift up to 1,500 lbs. These lift tables come in a variety of different sizes, each of which are designed in order to lift a different quantity of weight. These heavy duty lift tables are designed in order to allow you to safely lift heavy containers weighing up to 12,000 lbs. These tandem lift tables allow you to lift a variety of items weighing up to 12,000 lbs and have a wide table top allowing you to lift longer items easily and safely. With the addition of these gravity tilters you will be able to safely lift and tilt items up to 30 degrees. 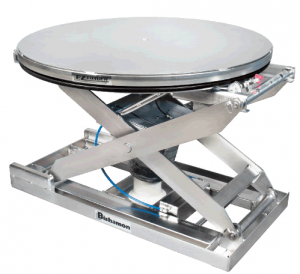 These tilt tables allow you to safely move items weighing up to 6,000 lbs and tilt them up to 45 degrees! These self propelled lift tables will enable to you safely move product throughout your facility without having to worry about accidentally damaging the product or employees being harmed. Able to lift up to 12,000 lbs these loading docks will enable you to easily move items up and down throughout your facility weighing up to 12,000 lbs. Low profile scissor lifts will help to ensure that your product is able to be safely moved without taking up a lot of floor space. A low profile loading dock is designed in order to safely be able to lift up to 5,000 lbs. without taking up unnecessary space. To expedite your quote request, please fill out one of our Application Forms. The information on this form helps us better understand your application requirements.